Members of Hormel Foods came together on November 14 to pack more than 50,000 meals as part of their partnership with Convoy of Hope. 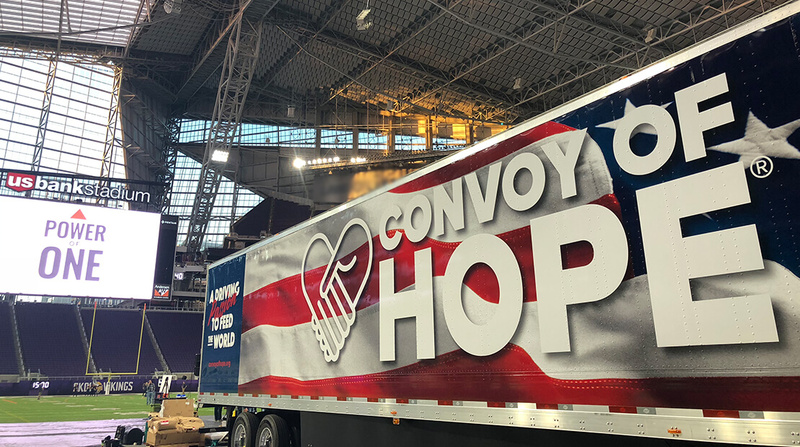 More than 200 Hormel Foods staff convened at the U.S. Bank Stadium in downtown Minneapolis, Minn. to help Convoy as part of the Foodservice team’s national sales meeting. They enlisted the help of The Pack Shack, an organization that assists nonprofits by bringing people together to pack meals. Hormel Foods originally helped support Convoy of Hope Community Events, which provide groceries, haircuts, dental screenings and other services to families in need. The partnership quickly expanded to include disaster relief efforts and other Convoy of Hope programs. Convoy of Hope is a faith- based organization with a driving passion to feed the world. With a long history as an early responder in times of natural disasters, Convoy of Hope has been a Four Star Charity as recognized by Charity Navigator for 15 consecutive years. Convoy of Hope has served more than 100 million people since it was founded in 1994. For more information, please visit convoyofhope.org.